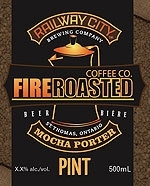 ST. THOMAS, ON – The London Free Press reports that Railway City Brewing has teamed up with Fire Roasted Coffee Company of London for a new seasonal beer. Fire Roasted Mocha Porter is brewed using Cafe Justicia, a fair trade and organic coffee from Guatemala, along with molasses and oatmeal. Railway City head brewer for Barbara Ziola describes it as having a distinct coffee flavour with notes of chocolate and a hint of sweetness. Fire Roasted Mocha Porter is a limited edition winter seasonal available at the brewery in 500 ml bottles, and at select bars and restaurants in the St. Thomas/London area.